Spring = garden events galore! So many great events coming up – lots of open gardens, workshops and more! More than 10 gardens open, of all sorts! A pass for all gardens is $15/person. Or visit single gardens for $5/person. School children free. Coaches welcome. Passes are available from Corryong Neighbourhood Centre, Corryong Visitor Information Centre & some gardens. Seed savers member Cathy Ross mentioned this event at our last gathering. She also noted: “Last year they organised a progressive dinner which visited 3 of the gardens at night. I am not sure if this is being planned again for this year but will let you know any details that I can find. If anyone is planning to stay for dinner / overnight (there are more gardens open than can realistically be visited in one day) then I am happy to help either suggest commercial accommodation to suit or have some spare beds / camping space at my house.” — If you’d like to take Cathy up on her offer, contact Seed Savers and we’ll put you in touch. Two regional gardens are open as part of Open Gardens Victoria over Cup weekend. Teas and produce will be available each day. Stanley – Stephen Routledge and Jenny Indian, 28 Pioneer Rd., Stanley, near Beechworth. Baarmutha – Jamie Kronberg and Peter Kenyon, Weir Lane, Baarmutha, near Beechworth. The Stanley established garden has developed over 2 decades and is based around three principles of shade, produce (home and commercial) and habitat. A cool climate, woodland garden, it contains many rare and interesting species in addition to over 40 species of Oak adjacent to the organic chestnut orchard. The Barmutha garden was established by an earlier owner and has been beautifully refined by the current owners. It is now a showcase of many fine plants and offers delightful views both within and over the adjoining landscape. Some of Beechworth’s most inspiring backyard veggie gardens & fruit orchards open to the public. Ride from patch to patch, gather a clutch of knowledge, galvanise your green thumb & be inspired to grow your own food. Three open gardens plus flower, craft, cooking, & photography show. 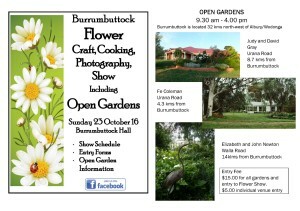 Gardens within 12 km of Burrumbuttock (32km from Albury). The properties have been in family hands for 3 generations and have modern features plus retaining some of the original buildings. The gardens include a country garden on a grand scale divided into colour themed sections. A 1930’s garden blended with a modern garden and a cottage garden surrounded with natives to protect the squirrel glider habitat on the property.Cost: $15 for entry to gardens and flower show. Or $5.00 per venue. A reminder that our final gathering for the year is a garden visit. We’re heading to RAD Growers, Erin O’Callaghan’s market garden and egg enterprise at Bungowannah. Tap into Erin’s passion for growing ‘real and delicious’ food and the challenges of creating a local, diverse market garden enterprise. More details to come, but please ensure you have this date in your diary! Learn about the diversity of pollinator insects with Manu and Karen from the Wild Pollinator Count, and create your own pollinator insect habitat (and artwork!) with acclaimed local artist Joanne Diver. Six workshops across the region. Free. Limited places, booking required. The Rotary Club of Albury Hume have also flagged they will host open gardens on this weekend. Details to come, but if interested you might like to keep an eye on their event page on facebook: facebook.com/events/1104909749546061. For more local event listings, see Ecoportal.net.au.We welcome your suggestions for future inclusions in this roundup – feel free to contact us with the details or leave a comment below. This entry was posted in Upcoming events and tagged events, inspiration, open gardens by Seed Savers Albury-Wodonga. Bookmark the permalink.